Front-facing cameras moonlight as healthcare monitors. It seems like everybody has a few jobs these days. 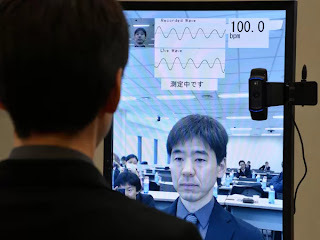 While there are existing apps for smartphones that use the device's camera to read a person's pulse on a fingertip, this is the first I've heard of such passive reading of blood flow in the face.